Deciding to foster or adopt a semi-feral cat can be a challenge. You can only guess at the cat’s personality as they tend to be very shy.A good clue to how the cat will adapt to affection and human interaction is the amount of curiosity and attitude they display. Remy, upon first meeting, seemed quite interested in me and very eager to approach for treats. He was very gentle when taking the treats although quick to retreat when they were not on offer. As I tend to be quite aggressively affectionate with any new cat (petting, scratching and picking up), I was very pleased that Remy dealt with it quite well. He was very nervous and preferred to hide, but he didn’t bite, scratch, hiss or swat. I hoped that this meant that he would settle in well to domestic life. As expected, Remy was very shy and nervous in his new environment; preferring enclosed spaces under chairs, in the bathtub and even in the litter box. He was alright with me approaching him very slowly and low to the ground, but didn’t like too much attention. And he especially didn’t like other people. A safe space: Remy loved his little cave under the chair (picture here) and it was easy for me to extract him if I needed to. Regular affection: I found that Remy needed positive attention regularly to encourage his comfort. Showing him affection throughout the day when I was at home was easy and I discovered that he enjoyed it more and more in that time period. However, when I was out of the house for a number of hours, he would regress somewhat and shake violently when I petted him. To help him adjust on the days I was gone, I made sure to give him a good rub down before I left and upon my return, always speaking in soft, positive tones. Feeding: this is a regular event that happens at least twice a day and a good opportunity to show the cat that you supply their food and care for their well-being. I used to feed Kiki whenever her dish was empty and she would self feed throughout the day. 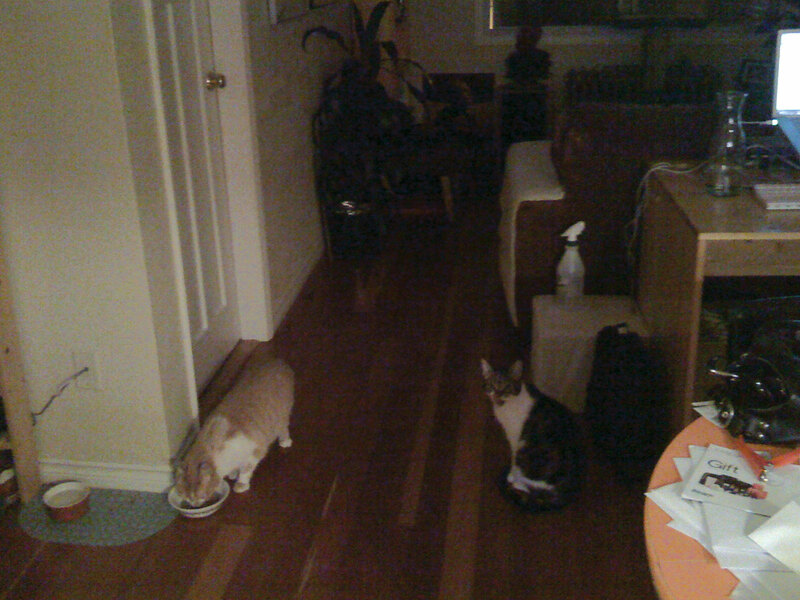 Meal times are now in the morning when I get up and at the end of the day, and servings are small (about 1/4 cup each twice a day) to ensure that the cats are ready to eat. This encourages Remy to approach me. Treats: everyone knows positive reinforcement is the way to go with cats. Remy got treats simply for petting or allowing me to brush him. Kiki has been a really good influence on Remy: anything Kiki can do Remy can do better. He began by following her to food. Jumping on the cat tree quickly became a favourite past-time as did lying on the back of the couch. He’s happy to curl up on a good soft pillow, but asking for pets is Remy’s latest passion, but only in the morning (before food) and in the evening (while I’m relaxing on the couch). Approaching me for affection is a really big step. It means that Remy trusts me and has really settled in well. I’m really pleased with his results in my home: it can sometimes take years for a rescued, semi-feral cat to warm up to its new family. Remy continues to be shy around other people, more so around males than females. Remy quite likes to play with my sister, Anna, and is interested in new people, but will not approach them. I feel quite sad for my boyfriend, Allan, that Remy seems to feel very threatened by him. I have hopes that this will change over time. Every day I look forward to seeing and experiencing positive changes in Remy’s demeanour. Today he rubbed up against my leg for the first time during morning pets; perhaps tomorrow he will decide to sit next to me on the couch?